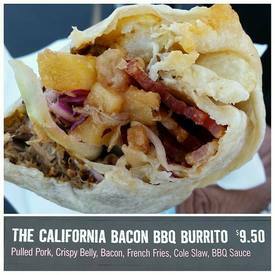 Every Californian is familiar with the "California Burrito". The standard assets of a California Burrito are a bed of warm, salty french fries tucked into the delicious combination of meat, sour cream, guacamole, rice and beans. But, where’s the creativity? Next time, try a California Bacon BBQ Burrito! With pulled pork, crispy pork belly, Bacon, French fries, BBQ sauce & Cole slaw … BOOM! !